3 Dahls: Murubbeh, Surprise, and UPM Caves, Al-Sulb Plateau, Eastern Province, KSA, Feb. 16 - 18, 2000. From Jeddah: John Pint and Susy Pint; from the Saudi Geological Survey: Mohammed Halawani, Saeed Al-Amoudi and Waddia Kashkari; from Riyadh: Lars Bjurstrom; from Dhahran: Greg Gregory; Marc Lamontagne and Lise Roussel. The trip plan was for everyone to meet at a designated communication tower landmark on Thursday morning, and then proceed in a group for the off-road portion to the caves. 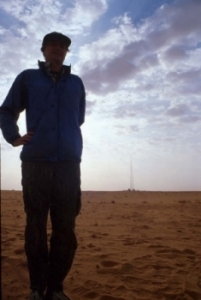 Marc, Lise, and I planned to leave Dhahran after work, drive the 400+ km to the tower and camp out for the night. Marc and Lise came by my house and we loaded my gear into their classic mid-80's Land Rover 'Country Wagon'. We drove west a few hours, and stopped for dinner at a truck stop restaurant. After cleansing ablutions at the facilities next to the truckstop mosque, we entered the separate door to the restaurant "family" section. The curtained booths, which ensure intimate and modest dining, were optional in our case, as we were the sole patrons. We enjoyed a typical wayside meal of vegetables, rice, lamb, salad and soda, and then continued down the road toward our waypoint. 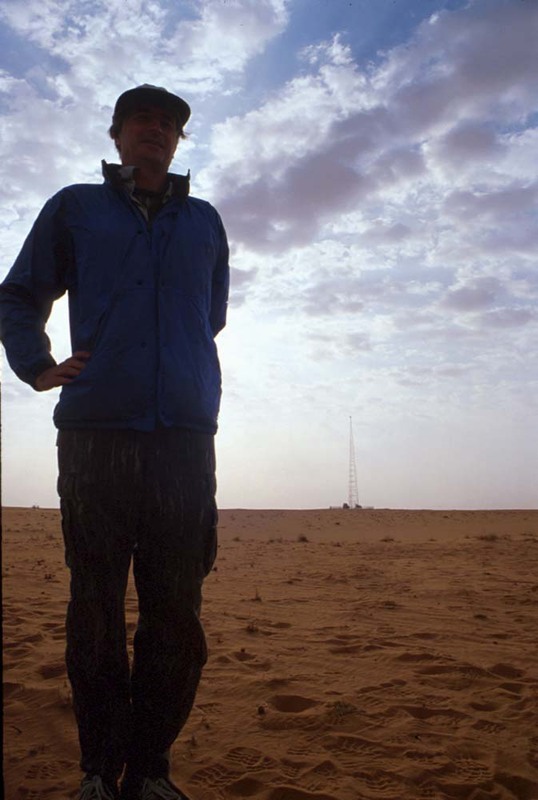 Thanks to Marc and Lise's binoculars, they spotted the unlit 400' Aramco communication tower, and we began a shortcut traverse across the small dunes to our morning meeting point. At our campsite there were virtually no lights on the horizon, but a sky full of stars and a nearly full moon illuminated the desert. Anticipating that the other participants would be showing up late due to mobilization logistics out of Riyadh, I told Marc and Lise that they could probably sleep-in a bit. The next morning, just after we had packed up our night gear, we got a surprise greeting from John, Lars and Susy at exactly the appointed time. Breakfast would have to be managed en route. We met up with the Ministry Geologists and continued north on the sand track "highway." At the Dahna dunes on the north side of Shawiah (a small desert town with no connecting paved roads), one of the Ministry Land Cruisers bogged down in the dune sand briefly. 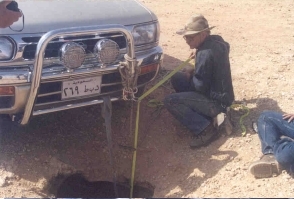 After another 20 minutes of driving we stopped briefly at the vertical entrance holes for UPM cave (Named after King Fahad University of Petroleum and Minerals back when it was just UPM). We then drove another 20 minutes, arriving at the large collapse entrance to Dahl Murubbeh (also known as Shawiah, B-7, Crystal Palace and Quad). This cave is somewhat unusual for the area. It has a large entrance, and rope or ladder assistance is not required. It is much cooler than the other caves (approx. 62 degrees, whereas the others are more like 78 degrees). 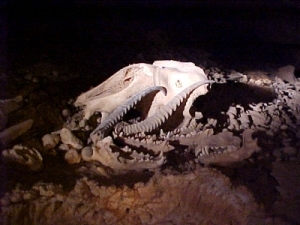 It goes deeper than many of the other caves; and it has thousands of bones. 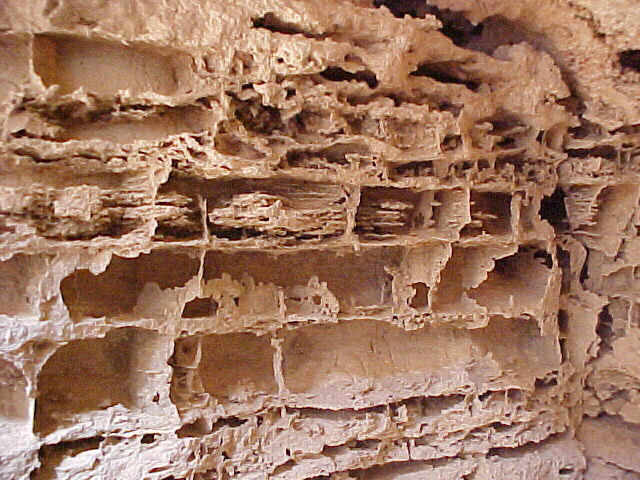 Many of the bones were probably brought into the dark recesses of the cave by hyenas. Bones are from camels, hyenas, gazelle and other smaller animals and there are some human remains! Some bones have been dated at 1000 years BP. 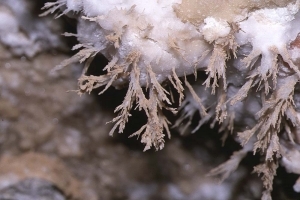 This cave has some unique delicate carbonate and platy gypsum crystal formations and the cave may have had hydrogen sulfide contributing to its origin. We suggested that Ministry representatives should talk to area residents, to reduce any additional unsightly damage to this beautiful cave. We also reviewed standard caving practices to minimize our impact on the caves during our visit. Next, we proceeded down a steep incline to the main passage which leads past a high dome to a large display of delicate feathery crystal helictites. Amid the fragile, feathery/furry helictites were thin gypsum 'plates' which were so delicately suspended from the ceiling that it appeared as if they had been glued in place. We signed the cave log sheet, then proceeded to a side passage for more viewing of speleothems. Here the ceiling is covered with gently rounded cloud-shaped formations which sparkle and twinkle with every movement of a headlamp. Then we made our way back to the entrance where John was all set to take us into another section of the cave. "No, No! We need a rest," cried several people. "It's tea time!" After our break, we climbed down a side passage near the entrance, past a cache of fragrant bat guano and ultimately arrived at the hyena lair containing bones and coprolites. We marveled at the human and hyena skulls, the curved, ribbed gazelle horns, and other bones and items in the cave, before returning to the surface. Next we packed up and drove to 'Surprise' cave. Lars discovered Surprise cave last year. It was the 20th hole in the ground that he had investigated that weekend, the previous 19 having only limited extents and minimal speleothems. 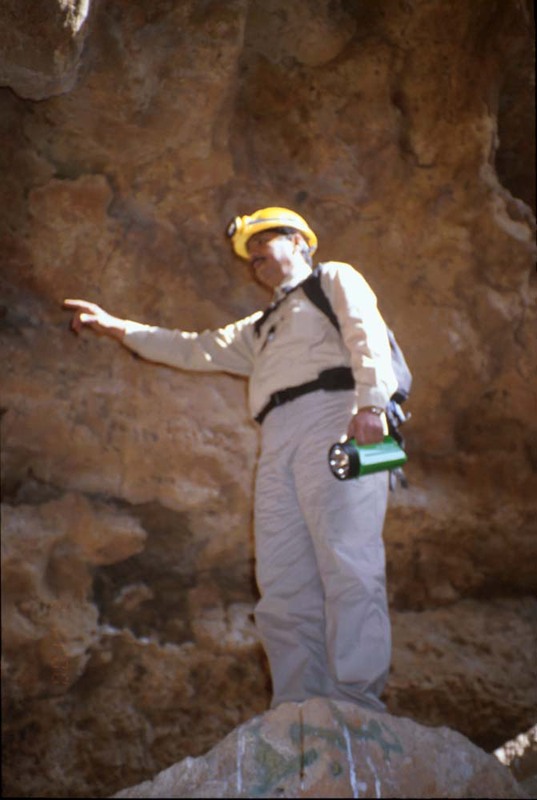 However, Surprise has passages and speleothems which rival the largest cave in the area, Dahl Sultan, which was discovered by John Pint and Dave Peters in the early '80's. John and various assistants had mapped more than 500m of passage in Surprise and continued mapping was one of our goals for Friday morning. The cave appears to have just one small vertical entrance. We rigged up John's hand-made 17 year-old cable (and PVC tube) ladder to the front bumper of Lars' Nissan Pathfinder, and began belaying folks down the 14m vertical drop. Once everyone was down, Lars led us through the contorted passages until we arrived at a large open room, called Lars' Lair. This room is the starting point for 4 additional passages, and we followed one of them to some marvelous speleothems, including Jaws and the Chandelier Room, featuring several unusual "ducktail" shaped formations. 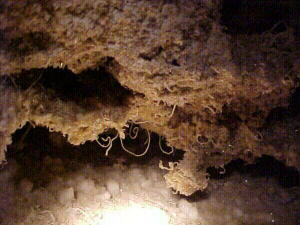 Many of the speleothems are still wet and dripping. After some awestruck minutes, we realized we were behind schedule -- The SGS group had to surface soon, and catch a plane back to Jeddah that night. We made our way back to the surface and had a quick sampling of the snacks that the SGS geologists had brought along. We looked at some maps of the area, and Mohammed pointed out some large Dahls further south that could be of interest to visit in the future. We exchanged cards and bid the SGS geologists farewell, until the next time. Now Lars encouraged us to get packed up and mobilized quickly, so we could get over to UPM cave for our third cave visit that day. Shortly after arriving at the UPM entrance, we were visited by a herd of camels, tended by 2 Bedouins. 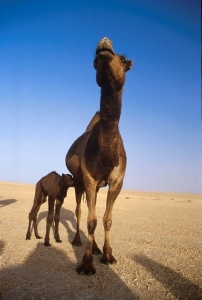 The herd had several cute baby camels and we were drawn to take some photos of them. The camel drivers had little difficulty keeping the camels herded together, despite our friendly intrusion with our cameras. At the entrance, we again rigged up the cable ladder, and also dangled a long thick towing rope and auxiliary ropes for climbing beyond the end of the cable ladder. We belayed each other down, and then proceeded to a very large room: 80m x 50m x 15m. Lars had a cache of about 7 gas lanterns from previous visits, which he had used in illuminating this large room for photos. 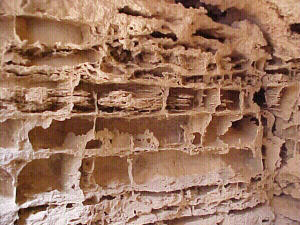 We traversed the limits of the room and visited a passage which had incredible thin gypsum helictites. The variety and shapes of the gypsum "needles" were amazing -- with appearances similar to roots, hair, etc. After capturing them with camera and video, we scampered back across the big room, and helped Lars extract his lighting gear from the cave. 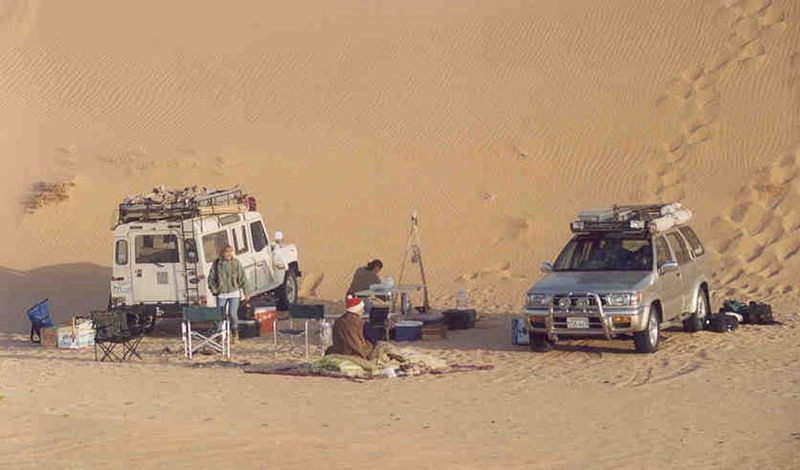 We surfaced just as it started getting dark, de-rigged and headed for the dunes, to get a campsite out of the wind. 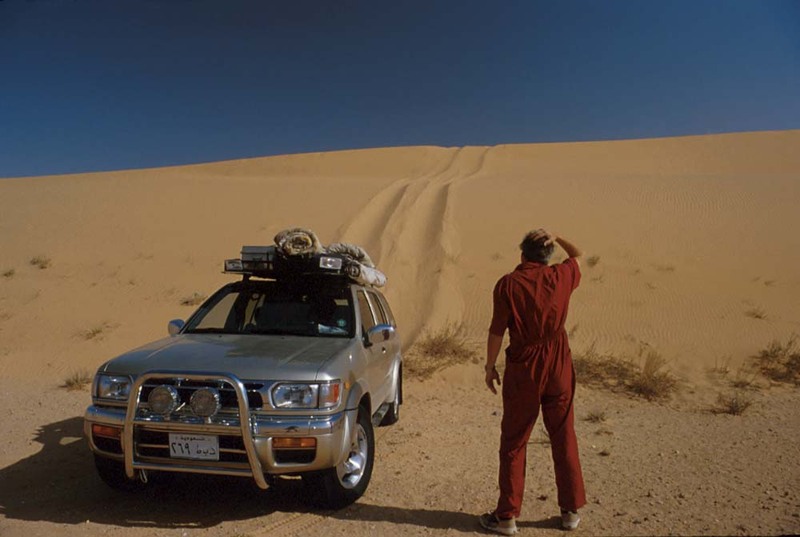 We headed over a series of large steep dunes, following Lars, who was trying to find one of his favorite campsites. It was quite exhilarating to charge up and down the steep faces of the dunes following their lead. However, coming over one of the dunes we found ourselves going down an extremely steep face, with Lars stopped abruptly below. Fortunately Marc was able to stop us in time before we ended up testing the resiliency of Lars' roof rack. A few more dunes later, following at a safe distance to the side, we found a nice protected area surrounded by the beautiful dunes. Lars set out a strobe beacon on top of one of them to mark our location, in case one of us got disoriented during any solitary excursions that night. Marc and Lise proceeded to set up the kitchen and dining facilities, complete with table, chairs, and other civilized comforts. Lise prepared an exquisite salmon-caper-onion-labna (similar to cream cheese) and wheat bread 'appetizer' which was an incredible delight, and set the standard for the dinner to follow. Olive and pickle garnishes, fresh salad, marinated grilled lamb cutlets and much more, made this a meal beyond compare. Lars built a huge campfire from a raft of 2 x 4's he'd hauled on his roof rack, and we soon found ourselves nodding off by the embers. The next morning, Lise prepared sliced apples and yogurt w/ Canadian Maple syrup (Marc and Lise are French-Canadian), and other breakfast treats. We noticed that our campsite was littered with hundreds of thin buff colored fragments, which Lars recognized as (recent fossil) ostrich eggs. We packed up and traversed the dunes, towards Surprise cave. On the way we spotted a large promising drainage area and vertical shaft, and we quickly rigged up the ladder and climbing ropes. 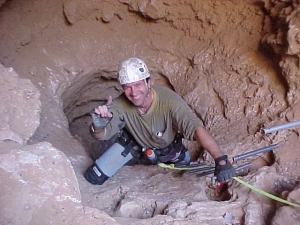 Marc was the first down to explore the cave, which appeared to have considerable sand fill, limiting the extent to which we could go without a lot of digging. We returned to the surface and proceeded on to Surprise. We rigged up, belayed down, and proceeded to Lars' Lair. 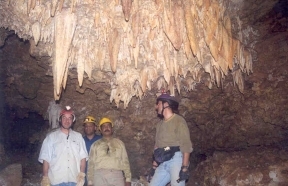 Everyone participated in surveying one of the 4 passages connected to the Lair. 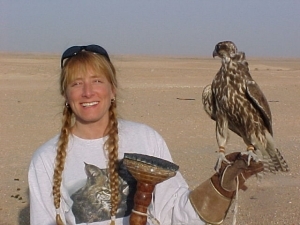 Susy Pint helped ensure that I was getting proper compass bearings. After about 40 minutes we completed the survey, bringing the surveyed length of the cave to 562 meters. 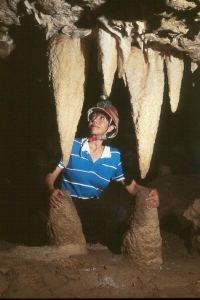 We intended to see and photograph additional areas of speleothems, but John and Susy had a plane to catch that evening, and our time had run out. We made our way back to the surface, utilizing my ascender to help with hauling up our gear bags. John and Susy packed their gear, making it airport ready. Then we bid John, Susy, and Lars good by. It was great to get out caving with them again. John and Susy are moving back to their home in Guadalajara, after having spent much of the last 20 years in Saudi Arabia. John is the foremost expert on caves in KSA, and his expertise and enthusiasm for caving will be sorely missed. We hope that he can come back and do cave mapping projects for Saudi Geological Survey or the Ministry of Petroleum and Minerals. He's the right man for a job that's waiting to be done! After Lars and the Pints left, we decided that there was no need to rush off back to Dhahran from our beautiful isolated setting at the entrance to Surprise cave. We unpacked the tables and chairs, and Lise and Marc prepared yet another superb open air meal. After taking in the vast desolate scenery, we reluctantly packed up to head towards blacktop. A short distance down the trail we pulled over to see a huge ant mound.